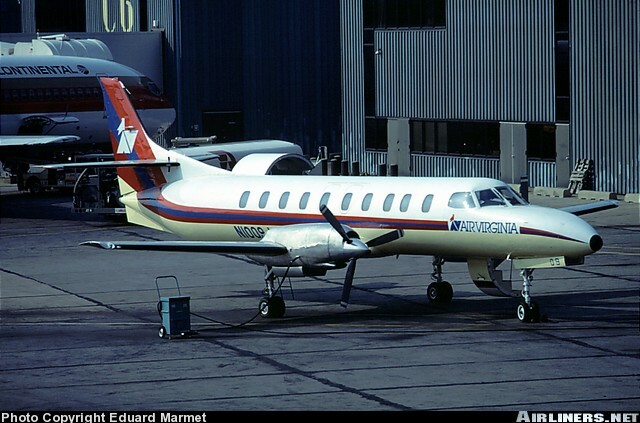 Air Virginia Swearingen SA-226TC Metro II, N1009J, is shown at Philadelphia International Airport on August 9, 1983. Lynchburg-based Air Virginia began operations on March 1979. The airline purchased Mid-South Commuter Airlines in 1983. The airline had a brief association with United Airlines before becoming an American Eagle carrier on May 15, 1985. The company was renamed AVAir on November 1, 1986. After declaring bankruptcy in 1988, the company was purchased by the Nashville Eagle operation of American Eagle.